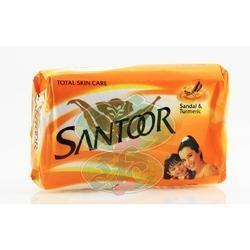 Santoor PureGlo is Transparent soap having an exotic, long lasting fragrance which is enriched with Glycerine, Honey and Almond oil to give you moisturised glowing youthful skin. Glycerine moisturizes the skin to give a healthy soft skin, Honey acts as a natural Antioxidant to give youthfulness and glow to the skin and Almond oil gives deep moisturization and nourishment to the body. 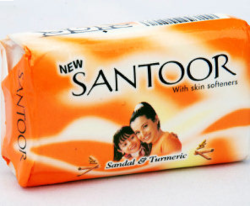 Sandal and Turmeric have been an essential part of Indian woman’s skin care regimen for centuries. The deep acting ingredients of Turmeric and Sandal not just provide a smooth, soft and clear skin but also give a youthful glow to the skin plus it has a fresh energizing and a long lasting fragrance. Deep acting ingredients of Sandal an Almond Milk soften and moisturize your skin making it look younger. The new variant Moisturized Soft Skin provides a whole new bathing experience. A new lingering fragrance enhances the entire experience.